Thinking of living room design ideas are hard, which is why we have thought of some for you! Over the years we have renovated many living rooms. This post will give you plenty of inspirational living room design ideas to get you started. 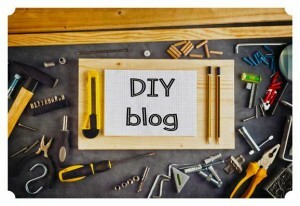 Or maybe you just need some decorating tips. What To Do With Living Room Fireplaces? Living rooms should make full use of the space inside it. However, some living room layouts can be awkward due to things such as a fireplace. 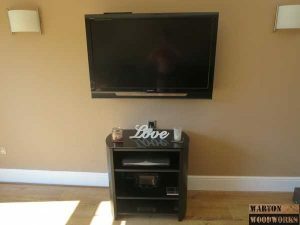 Living rooms have a variety of electrical equipment which connect into TV’s. 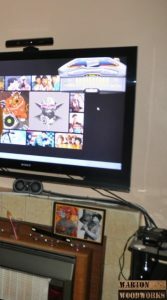 In general TV’s look best in the center of a room, which allows easy viewing. 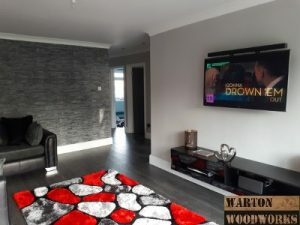 Below is an image of a fireplace located in the centre of this customers living room. They have worked around this problem by installing the TV on the wall above it. 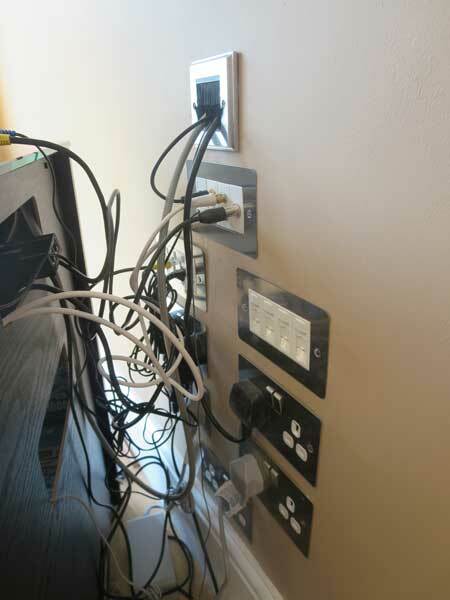 However, it is not an ideal solution as you can see the cables for the TV. Also this particular fireplace looks old, and does not fit in with the rooms decor. 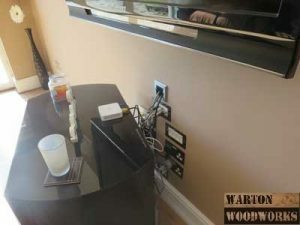 We found a better solution for this customer, one that would hide their TV cables. This involved removing the fireplace, as it was not used anyway. 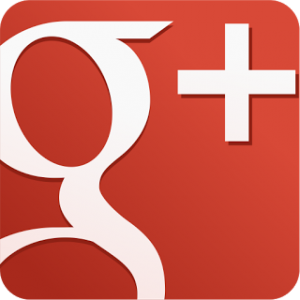 Gas was isolated safely via a gas safe engineer. All electrical connections for the TV were then hidden inside the old chimney cavity. Whilst doing this extra connections were installed too, such as plug sockets, and Ethernet ports. Removal of this fireplace has made the customers living room look more tidy and modern. Helped the customer brainstorm different living room design ideas. Old fireplace and mantle piece was removed. Wires from the TV were fed through the chimney cavity. This was done by drilling two holes the size of a brush face plate. 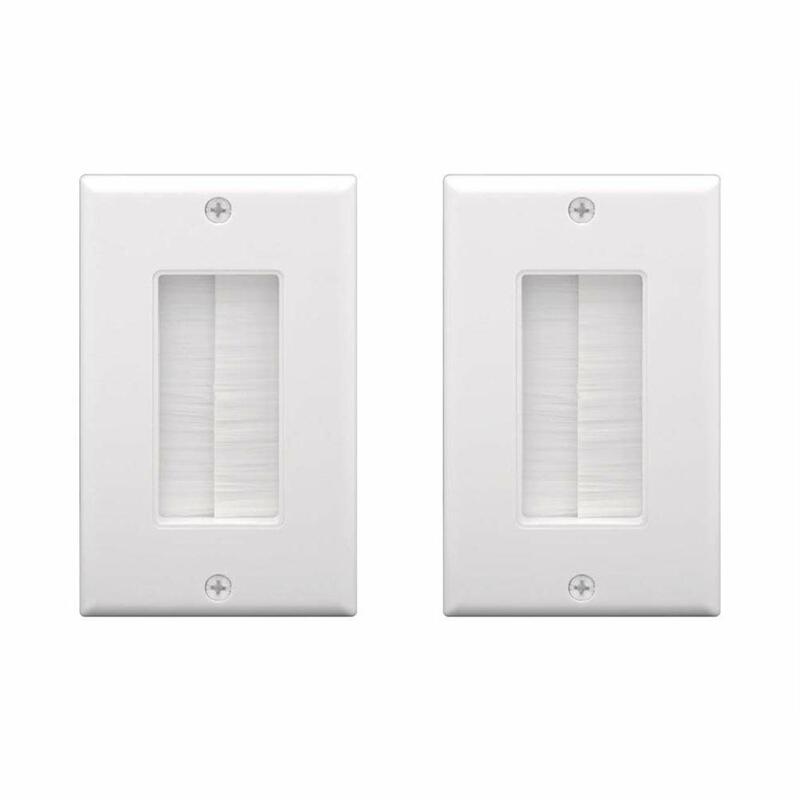 These brush face plates were installed behind the TV and cabinet. Electrical connections were fed through the fireplace cavity into the loft. Please note that the chimney top had been removed prior to starting work. Take care if running cables through a fully intact chimney. Capping may be required to prevent water entry, whilst allowing air flow. Installed 5 double power sockets, as this looks neater then the customer using extension leads. 8 Ethernet sockets were installed, as this is more reliable then wireless. Wireless networks are known to drop out sometimes due to interference. Wired connections offer faster and more reliable internet connections. The customers smart TV, music system, sky box and games consoles all connected directly to these Ethernet ports. 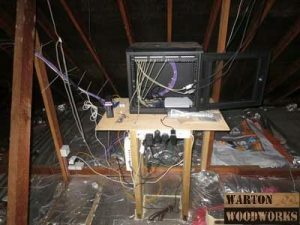 Network connections were also used to send Sky TV signals to another room, find out how here. Below is an image of the Ethernet network server cabinet in the loft of this bungalow. Installed a TV socket, as this is the most convenient place. 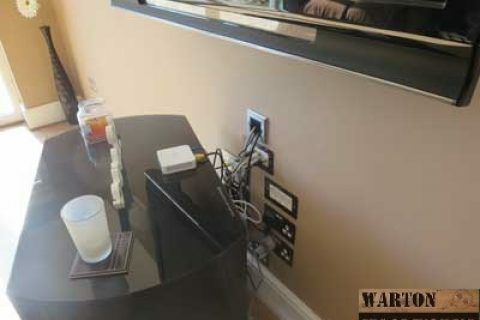 Some TV sockets are placed far away from home owners TV’s. Having one less than 1m away is ideal, and helps to reduce signal noise (unwanted signals). Installed a BT socket, as Sky TV requires connection into a phone line. Fireplace was then boarded up, ensuring holes were cut out for the electrical connections. Fireplace boarding was then plastered over and painted. Feature walls in living rooms are very popular. This is because they create a nice focal point, adding something interesting to the room. 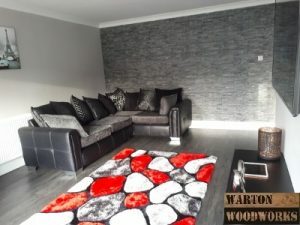 Typically a feature wall has a different colour, that stands out from the other walls within the living room. Usually this is achieved using a different coloured paint, or a patterned wall paper. We are going to suggest something you may not have considered, and that is PVC cladding. You can read more about the slate effect PVC feature wall below, plus others here.